Manchester City 1999 Wembley shirt Show support for your favourite team in the Manchester City 1999 Wembley shirt which is styled with yellow and black contrast stripes for a stand out look. 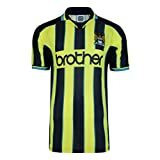 В Styled with the team badge on the chest and sponsor across the chest, you can enjoy a proud look when you wear this Manchester City 1999 Wembley Shirt. Benefits of this Manchester City 1999 Wembley shirt Short sleeves Manchester City Embroidered Badge Flock printed Sponsor Machine washable Manchester City 1999 Wembley shirt The 199899 season saw Shaun Goater score 21 goals, finishing the season as Manchester City’s top goal scorer. The last of these was the winning goal in a play-off semi-final against Wigan Athletic, sending Manchester City to Wembley Stadium for a playoff final which saw City promoted after a penalty shootout. Goater appeared 212 times for City and scored 103 goals between 1998 and 2003, finishing as the club’s top scorer for four consecutive seasons. This entry was posted in Soccer and tagged 1999, City, Draw, Football, Gents, Manchester, Mens, Retro, Score, Shirt, Soccer, Wembley by FPSports. Bookmark the permalink.